(NaturalNews) An amazing and, if legitimate, shocking, video out of Australia that is going viral purports to show someone lighting methane gas on fire in an river near a fracking operation. "A RIVER ON FIRE! Gas explodes from Australian river near fracking site. I was shocked by force of the explosion when I tested whether gas boiling through the Condamine River, Qld was flammable. So much gas is bubbling through the river that it held a huge flame," said Greens Party MP Jeremy Buckingham in a short narrative posted online April 22, after he lit the gas afire. "There has been concern that fracking and extraction of coal seam gas could cause gas to migrate through the rock. Not only is it polluting the river and air, but methane is an extremely potent heat trapping gas. Fugitive emissions from the unconventional gas industry could be a major contributor to climate change and make gas as dirty as burning coal," the narrative continued. "Gas first started bubbling though the river shortly after the coal seam gas industry took off in the Chinchilla area. Since then the volume of gas bubbling through the river has massively increased and has spread along the river," said the narrative, adding that the Queensland government marked each gas seep with a stake (visible along the banks in the video) near where the fracking company, Origin Energy, set up gas monitoring equipment. 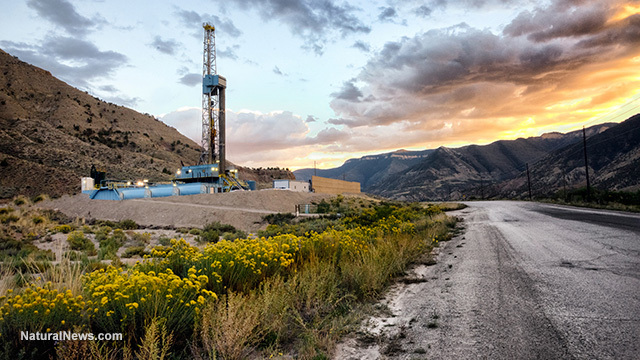 Hydraulic Fracturing, or fracking for short, is a well-stimulation method that uses high-pressure liquid to fracture rock so that trapped natural gas and oil can flow more freely. While the so-called "fracking revolution" has dramatically boosted the supply of fossil fuels around the world – and in particular the U.S. and Canada, thereby driving down prices – the practice remains controversial everywhere it is being used. Natural gas drillers exploit government loopholes, ignore decades-old environmental protections, and disregard the health of entire communities. "Fracking," a violent process that dislodges gas deposits from shale rock formations, is known to contaminate drinking water, pollute the air, and cause earthquakes. If drillers can't extract natural gas without destroying landscapes and endangering the health of families, then we should not drill for natural gas. "No state has adequate protections in place. Even where there are rules, they are poorly monitored and enforced. Thanks to the multiple federal exemptions, we can't even count on the federal government to keep us safe," said Allison Chin, Sierra Club president, July 28, 2012, at the Stop the Frack Attack rally. "No industry, no matter how wealthy or powerful, can withstand the righteous passion of the American people," she continued. "The out-of-control rush to drill has put oil and gas industry profits ahead of our health, our families, our property, our communities, and our futures. If drillers can't extract natural gas without destroying landscapes and endangering the health of families, then we should not drill for natural gas." In an interview with RT, Buckingham laid the blame for the bubbling gas squarely on fracking and the energy company involved. "They have thousands of gas wells around this river, around this site. They drill, they frack, but the gas isn't just flowing up their gas wells, it's coming through the ground," he said, adding that Origin Energy "should be condemned for polluting one of our most important rivers." Defenders of the practice include Democratic presidential frontrunner Hillary Clinton, who said called natural gas a "bridge fuel" in a recent debate against her only opponent, Sen. Bernie Sanders, I-Vt.
"What we need to do to go from where we are, where the world is heavily dependent on coal and oil, but principally coal, to where we need to be, which is clean renewable energy, and one of the bridge fuels is natural gas," she said in mid-April, as reported by Bloomberg News.